Track is available for use from 8 am - 8 pm. 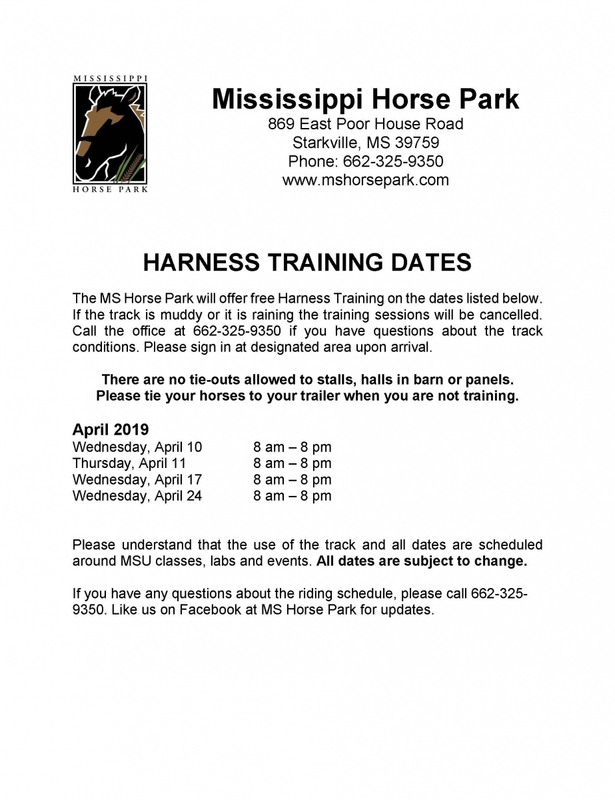 The MS Horse Park will offer free Harness Training on certain scheduled dates. If the track is muddy or it is raining, the training sessions will be cancelled. Call the office at 662-325-9350 if you have questions about the track conditions. Please sign in at designated area upon arrival. There are no tie-outs allowed to stalls, halls in barns or panels. Please tie your horses to your trailer when you are not training. Please understand that the use of the track and all dates are scheduled around MSU classes, labs and events. All dates are subject to change.